Discussion in 'BTLS Archives' started by mrpacs, Oct 20, 2008. 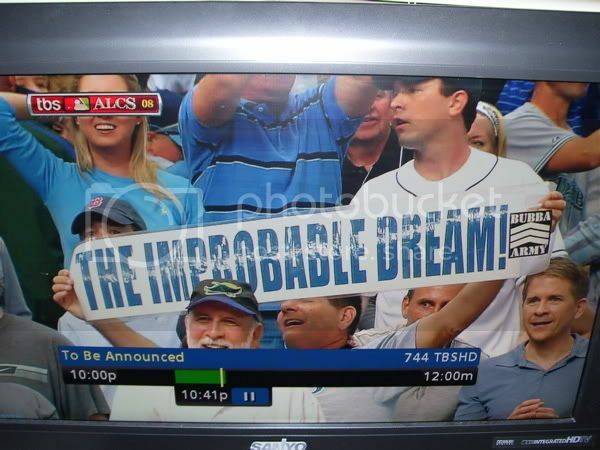 Anyone catch the Ray's fan holding up a banner saying "improbable (something) - Bubba Army" right after the Ray's won game 7? That's great. I wish someone could find a pic of this. Bubba would love to see that pic. Nice ! Thanks for taking the time to find it and post. That's some pretty high quality for a screen capture AND a TiVo freeze frame. Goodness gracious. Perhaps so...when I mention TiVo I mean DVR. It's sort of like calling all cola drinks Coke. It's laziness on my part. looks like a digital camera pic; notice the TV bezel. Comcast DVR not TiVo? Doesn't Bubba do a terrestrial radio show in the TB area?